What are Keloids or Kelod Scars? Keloids, or keloid scars, are the buildup of collagen caused by an overgrowth of fibrous tissue resulting from damage to the skin. Damage to the skin can be from numerous things, accident or self inflicted, such as cuts, scrapes, burns, piercings, and surgeries. Keloids are usually pink or red and are raised above the normal skin. Keloids are different from other scars in that they have the ability to stretch beyond the original boundary of the wound. They can be very painful, itchy, and even affect muscle function. Keloid scars are often confused with hypertrophic scars, but they are very different. It is important to distinguish the different types of scars so that the best treatment possible can be put into place. 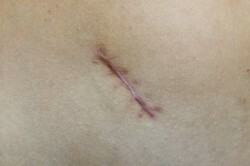 Under normal circumstances after an injury a flat pale scar is left behind. Hypertrophic scars are often thick and red and take take more than a year to fade on their own. To help aid in the recovery process, steroid injections can be given to flatten the scar and reduce redness. Hypertrophic scars do not extend past the injury site. Keloid scars can form from a normal scar sometime after the injury has occurred. They can come about from an irritated pimple that has been scratched. Burns, piercings, and surgeries are also causes of keloid scars. Keloid scars are very unattractive. They are often shiny, red or pink, and rubbery feeling. They may start out small but can spread way beyond the point of the original injury. Keloids are painful and itchy and usually appear on the back, shoulders, chest, or earlobes. It is not known why some people develop keloid scars more often and more easily than others. Some studies show that the damaged skin cell’s inability to perceive and correctly respond to their microenvironment is the main cause of keloids. Keloid scars can be developed by anyone but they are much more common in those with darker colored skin. Because women tend to have more body piercings than men, they are also more prone to be affected by keloid scarring.